We motored slowly out of Ganges Harbour, dodging the usual many crab trap floats, and headed south, then east toward Trincomali Channel. Then we turned south into Navy Channel. This is the view from Trincomali Channel looking south toward Navy Channel, with Mayne and Saturna Islands in the distance. 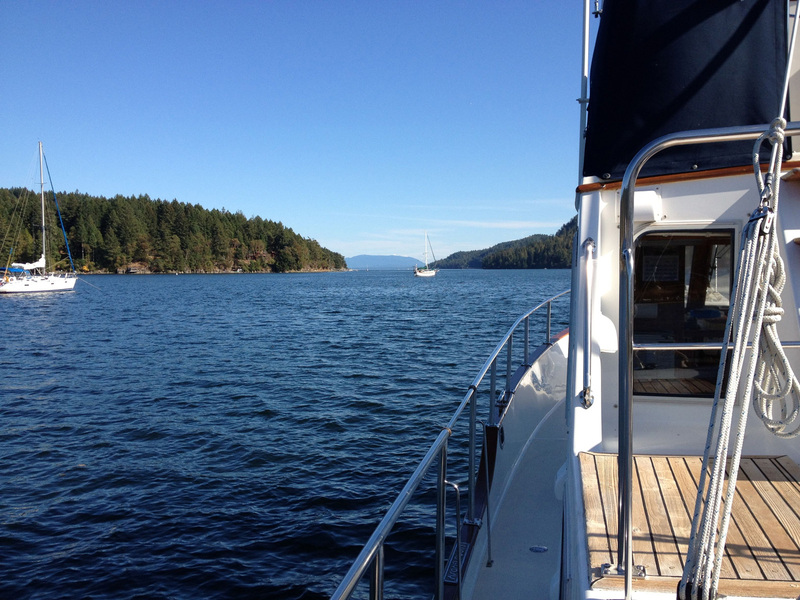 After our walk through the Saturday Salt Spring Island Market, we got things ready to leave Ganges Marina. Checkout time was 1100, but we were ready to leave shortly after 1000, and were underway by 1015. Leaving our side tie at the dock was a little tricky because a fresh northwest breeze was pushing us toward the dock and there was little space to maneuver. After we passed Active Pass, we continued south in Navy Channel. 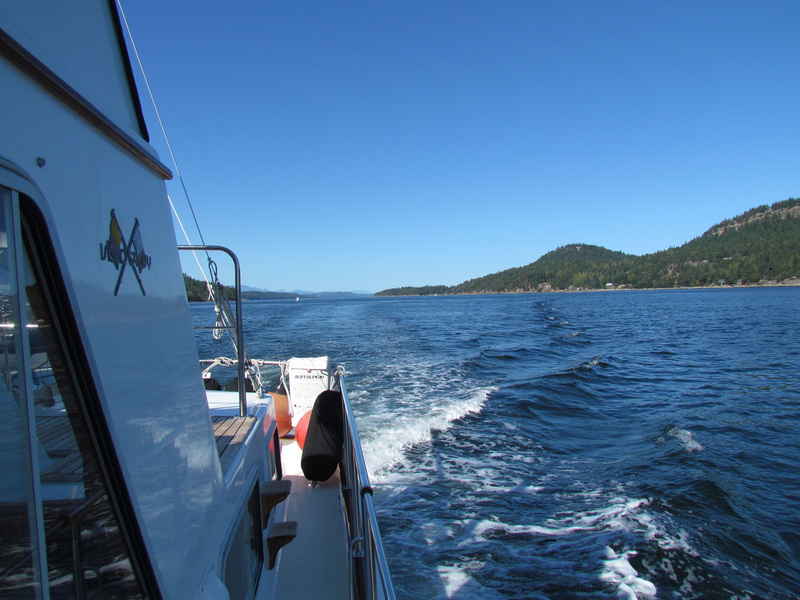 This is the view looking back, with Galiano Island in the background. We had just enough room to back away and were able to turn around so that we didn’t have to back out the fairway. We had to be back in Anacortes in 4 days, so figured we’d start working our way south. On the way north, we enjoyed the passage through Navy Channel and Plumper Sound, so looked up possible destinations in our Dreamspeaker Guide of the Gulf Islands for anchorages along that course, and decided to try a new place tonight — Port Browning, on North Pender Island. 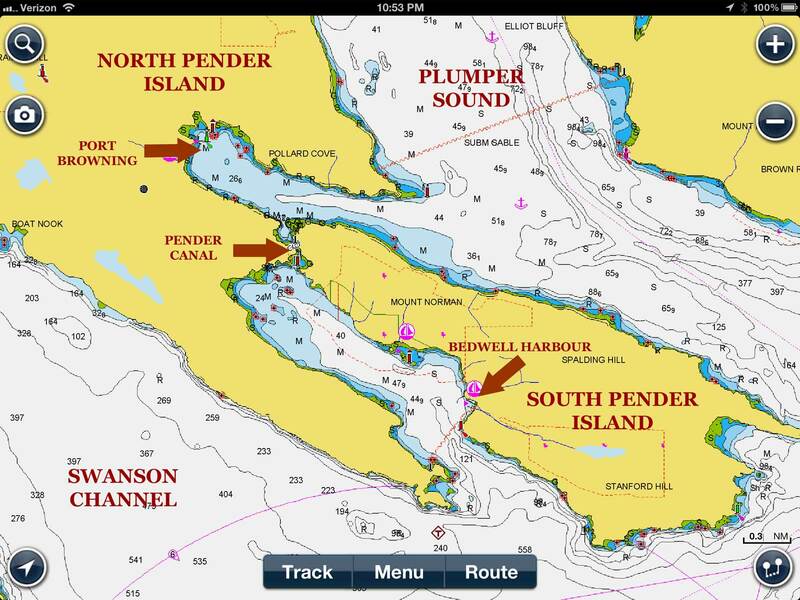 This chart is a screen shot from the Navionics app on my iPad, showing the area around Port Browning. It was a warm sunny day with light Northwest winds behind us, making it a very nice passage. The distance between Ganges and Port Browning is approximately 17 miles. It took us a little over 2 hours at a cruising speed around 7 knots (to optimize fuel consumption), and we arrived in Port Browning at 1230. We found a few boats in the anchorage, but there was plenty of room for more. We found a spot to anchor just off the sandy beach, in about 30 feet at low tide. The anchor set nicely. From our anchor location, this is the beach at the head of Port Browning. The sand beach is extensive and a great place to walk or just sit and enjoy the water. Port Browning Marina is on the right in this photo. Port Browning is an inlet that is formed between North and South Pender Islands. It has a large area for anchoring, a wonderful sandy beach, a government dock, and a resort—the Port Browning Marina. There is a pub (the Port Browning Pub) and local shopping (Driftwood Centre shopping area) about a half-mile walk from the marina. Port Browning Marina is at the head of the inlet. The government dock is just out of view to the right in this photo. 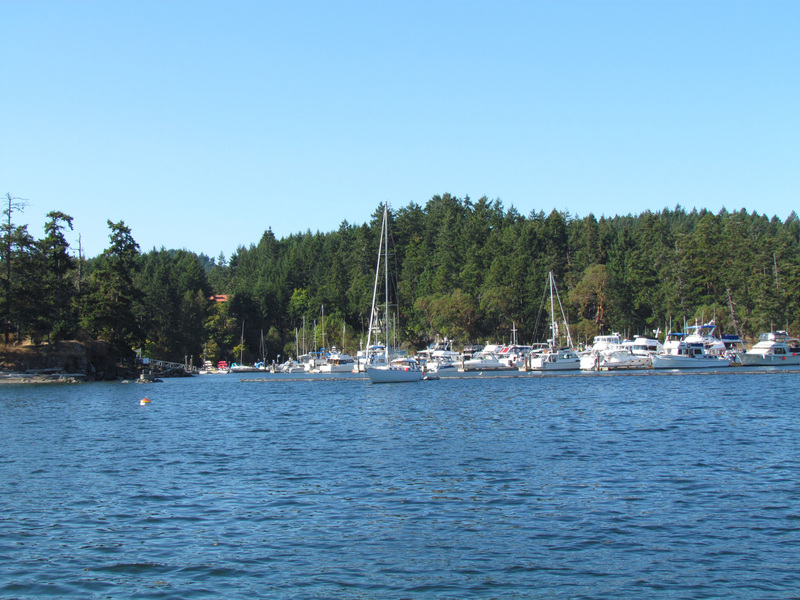 Bedwell Harbour on South Pender Island can be reached from Port Browning through Pender Canal, a man-made dogleg channel between North and South Pender Islands. The channel must be navigated carefully as it is very narrow, not very deep, and tidal currents run through it. Also, there is a bridge with 27 feet of vertical clearance over Pender Canal, limiting which vessels can navigate through it. This is a closer view of the Port Browning Marina. After our busy day in Ganges, today we were content to relax aboard Phoenix, and didn’t even put the dinghy over the side. It was a pleasant afternoon for reading, enjoying the quiet anchorage, and watching boat traffic. We watched several more boats come in and either go to the marina or anchor (it’s Saturday night) and by the late afternoon we noticed that the marina seemed to be turning away boats so we assume it was full. This is the view of Port Browning Inlet, looking out toward the southeast. 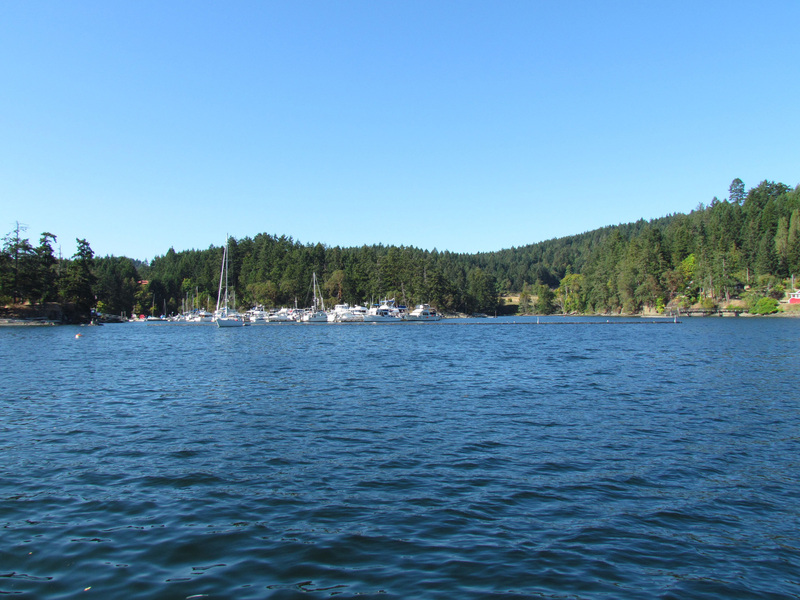 North Pender Island is on the left, and South Pender Island is on the right. Saturna Island is in the distance. The afternoon breeze died off at sunset and the evening was delightfully calm. This is a large anchorage and the entire area is relatively shallow, so boats can anchor most anywhere. It is exposed to the southeast, so would not be good in unsettled weather. The Pub has been busy all afternoon (we noticed the tables outside on the deck were full) so we assume it must be good. Something to try next time! 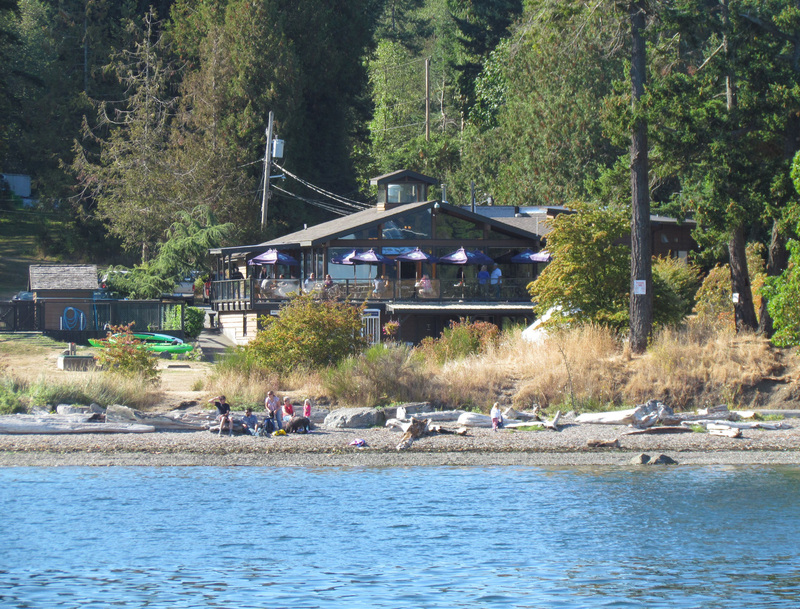 In this photo of the Port Browning Pub, you can see the busy tables on the outdoor deck. In the foreground there are people enjoying a sunny day on the beach. 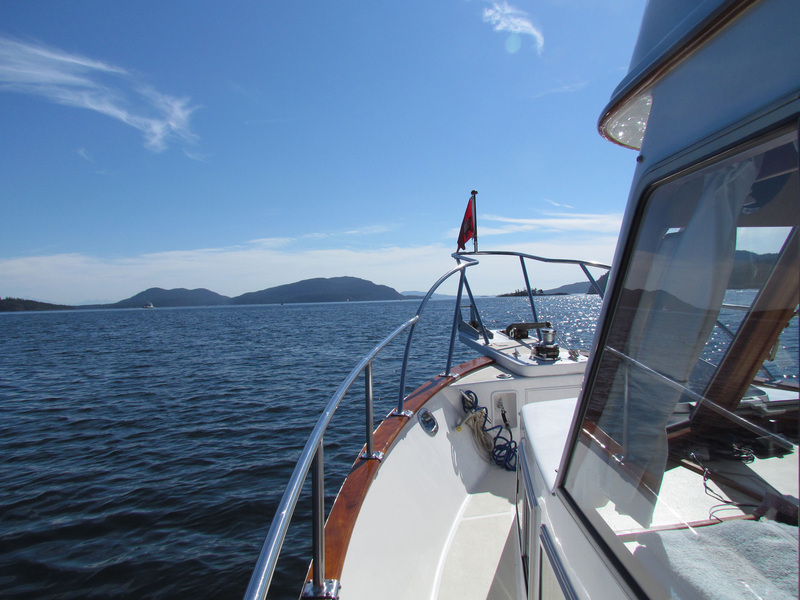 This entry was posted in Cruising, Travel and tagged Bedwell Harbour, Ganges, navy channel, North Pender Island, Pender Canal, plumper sound, Port Browning B.C., Port Browning Marina, South Pender Island by Sailor Lady. Bookmark the permalink.